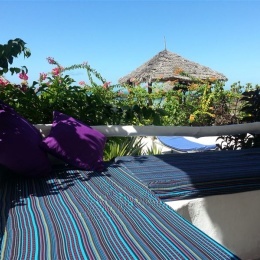 Saffron Beach Villa is situated in Bwejuu, Zanziba, only 45 minutes from the airport and is a great location for exploring Zanzibar Island. The double-storey unit is located under coconut trees, within walking distance of the beach. Within a 10-minute drive, guests will find a modern supermarket as well as various cafes and bars. 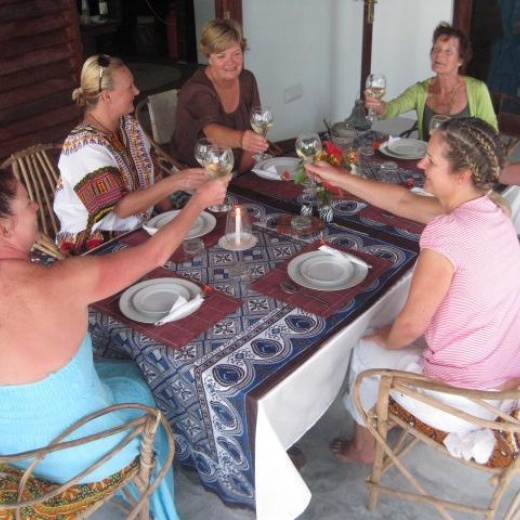 Saffron Beach Villa is perfect for honeymooners, friends and families. You can watch the sunrise or simply admire the ocean from the comfort of your own bed and enjoy the beautiful scenery and beach life. You have free Wi-Fi access and can make use of two bicycles. Each day complimentary ice, mineral water, coffee and tea are replenished. Zanzibar's East Coast is a haven for kitesurfing, snorkelling and simply relaxing on the beach. A beach lounge next door, Crazy Mzungo's, serves delicious cocktails and seafood, and guests should look out for special events such as happy hour, Sunday brunch and barbecue nights.